Most people know that there are certain foods they can eat to help various aspects of their health. These foods are called “functional foods.” One example of a functional food is yogurt, which contains healthy bacteria that can improve your digestion. Did you know there are functional foods for strong, healthy teeth and gums? These foods can make a huge difference for your child’s dental wellness. Research has shown that cheese reduces the acidity in the mouth that causes plaque. According to a study published in the Journal of General Dentistry, 12-15 year olds who ate cheddar cheese has lower acid levels in their mouth than those who ate other acid-reducing foods. Also, when the youngsters rinsed their mouths out with water thoroughly and removed the cheese residue, the acid levels went up again, demonstrating the acid-reducing properties of cheese even more dramatically. Your child needs serious “crunch power” to get through foods like carrots, apples, celery, or cucumbers. The good news is, all this crunching removes dental plaque. It also serves as a powerful cleansing mechanism. That means, instead of settling on your child’s teeth, the bacteria in their mouths gets cleared away. Prepare these foods as snacks and offer your child some kind of healthy dip to go with it! In a recent study published in Caries Research (“caries” meaning “tooth decay”), it was discovered that cranberries lower the risk of cavities by a good margin. How? Cranberries contain polyphenols, which seem to keep plaque from sticking to teeth. The downside is, cranberries are very tart so watch out for cranberry products with added sugar. Other powerful sources of polyphenols are both green and black teas. According to a study published in the Journal of the American Dental Association, drinking a glass of milk after eating dry, sugary cereal lowers the acidity of your child’s mouth significantly better than water. This is not to be confused with eating the sugary cereal with the milk, which turns the milk into a syrupy and sweet liquid that can actually increase the acidity of the mouth and cause harm to the teeth. It may also be helpful to drink milk after a sweet dessert. A little prevention goes a long way. Helping your child make the right food choices can go a long way to establishing a lifetime of dental health. 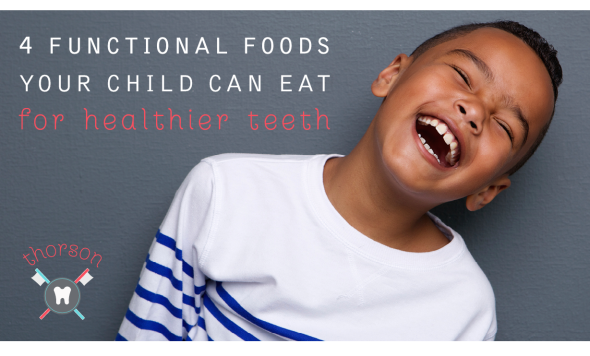 To find out more about functional foods that can help your child’s teeth, ask your pediatric dentist. Many early cavities are preventable so important to create positive habits and proper hygiene early on. That’s why the American Academy of Pediatric Dentists recommends that the first dental visit should be scheduled before age 1. At Thorson Dentistry, we wanted to add a level of fun and adventure that you couldn’t find at other dental practices. That’s why we created the Mirate (pronounced MY-rit). It’s a unique combination of a mermaid and a pirate. © 2019 Thorson Dentistry for Kids. All Rights Reserved.